Jan van der Putten is regarded as a true specialist in the young bird races. Every season he is among the most successful fanciers, winning several top results and championship prizes. In the past six months, for instance, he managed to win five top 10 prizes in the Best of the Best competition. These impressive results indicate that he is completely focused on his team of young birds. In fact the old birds are not raced in this loft. Jan has a demanding job in construction and his main goal is to be successful with the young birds, so there is no time left to spend with the old birds. That does not mean that he makes the young bird racing more complicated than it is already. He thinks simplicity is the key and he believes it all comes down to having great quality pigeons. In addition he aims to have a small group of young birds that are in their best form in the second half of the season. He lets a number of breeding pairs sit among the other young birds that are raced separately. Sometimes he puts a youngster that has been eating nothing but seeds in the nest of a pair that has been brooding eggs already. The best racing pigeons of Jan are mostly based on the bloodlines of Toury and ‘t Asduifke. Click here for the pedigree of Toury NL02-4147018 and the pedigree of 't Asduifke NL06-1257111. 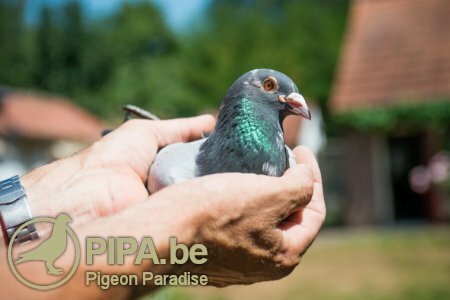 Toury won a 6th prize NPO from Toury against 4,497 pigeons as a young bird and he has been breeding an impressive number of successful racing birds since. He is, for instance, the sire of a 7th, 9th and 17th Ace Young Bird Best of the Best and his youngsters have won a total of thirteen first prizes. He was especially valuable when paired to ‘T Asduifke. Quite a few Jan van der Putten pigeons were bred from this sire and dam, which both have Schaerlaekens origins. 30-6  Hannut   19 – 3,078 p.
7-7   Isnes    17 – 1,000 p.
28-7  Laon      3 –   337 p.
11-8  Hannut    9 – 2,219 p.
18-8  Isnes    21 - 3,169 p.
Click here for the pedigree of NL13-1387268. The results from last weekend prove that the young birds of Jan van der Putten are in excellent form; he had no less than 7 prizes per ten with 21 young birds. As usual, Jan’s racing birds are getting even better towards the second half of the season. We wonder if he will be able to have one of his young birds in the top 10 for the Best of the Best competition again.